Today we decided to do a touristy sort of thing that the kids have been asking to do since day one. Go for a boat ride! There is a place called the "Source of the Nile." 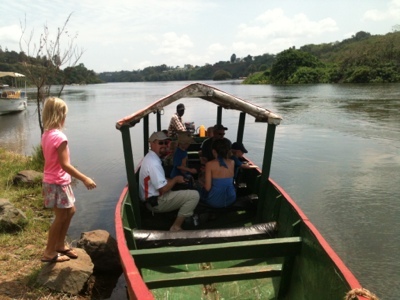 It is where an inlet of Lake Victoria flows into the Nile River and an underwater spring also feeds into the Nile. There is a monument where Speake stood as the first white man to see the source of the Nile River. And of course, there are souvenirs. So we decided to do our part to support the tourism industry in Uganda and enjoy a fun boat ride with our friends, the Lawsons. Here is the boat. We had a really fun time! On the way to the little island of shops next to the spring, we went past some tilapia cages. 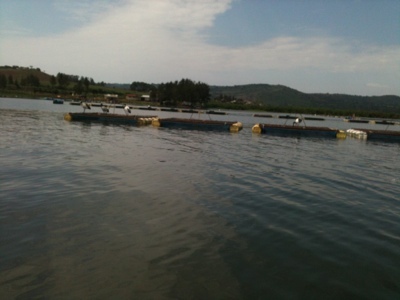 They have these cages floating in the water of Lake Victoria where they raise tilapia. These are probably the fish we buy at the market each week. Below is a photo of the cages. You will notice the birds standing on the lids hoping for a fish to swim too close to the top. Apparently these cages go several meters deep with thousands of fish. 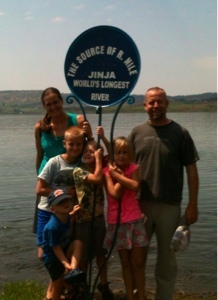 After boating around in Lake Victoria a bit, we went to the island that is next to the Source of the Nile. Here is our family photo at the sign. As you can see, this "island" is just a few inches above the level of the lake, at least when we were there. We found some crabs and snails and even saw some cichlids, a brightly colored freshwater fish. As we left the little island we went down the Nile just a little way. We went near one of the banks to see some monkeys and birds. While we were there we also saw a HUGE monitor lizard. It was maybe 5 feet long. The man who was giving us the tour also told us that they sometimes see a hippo near there. We did not see one today. As we were driving back, David was talking with the man about going fishing for Nile Perch. They do not have fishing poles here, so they just hold the line with the bait fish and hook on the bottom and hope to catch a fish that can weigh up to 500lbs. That sounds a little crazy to me, but David wants to do it. If he ever catches one, I'm sure there will be a blog post about that!